Who Will Blink First — Barcelona or Madrid? President of the Catalan parliament Carme Forcadell, center, sits with parliament representatives to discuss their next move after Spanish government announced plans to remove members of the region's pro-independence government, at the Catalonia Parliament in Barcelona, Oct. 23, 2017. Catalan separatists are devising nonviolent plans to resist the imposition of direct rule by Madrid. With days to go before the Spanish government secures parliamentary approval to curb Catalonia’s semi-autonomy, separatist leaders are promising to disrupt Madrid’s efforts to shutter their regional government, which could start by the end of the week. They have pledged to meet any deployment of the national police with what the leaders say will be “walls of people.” And they say that new bosses sent in by Madrid to oversee Catalonia’s own regional police, the Mossos d’Esquadra, and Catalonia’s public broadcaster as well as the regional tax authority will face obstructionism and disobedience. FILE - Spain's Prime Minister Mariano Rajoy gestures as he delivers a statement at the Moncloa Palace in Madrid, Oct. 11, 2017. 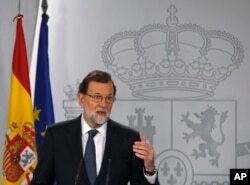 Spain’s conservative prime minister, Mariano Rajoy, and the country’s three main national parties are adamant that the unruly northeastern region won't be allowed to secede. They maintain Catalans broke the law when they held an independence vote on October 1, which was deemed illegal by Spain’s Constitutional Court. According to Spanish officials, Madrid’s current plan is to remove from their offices only the top echelon of Catalonia’s government, including regional president Carles Puigdemont and his deputy Oriol Junqueras but will leave in place other Catalan ministers, government officials and the executives of public companies so that they can continue to oversee day-to-day administration. FILE - Catalan regional President Carles Puigdemont addresses to the media after a ceremony commemorating the 77th anniversary of the death of Catalan leader Lluis Companys at the Montjuic Cemetery in Barcelona, Spain, Oct. 15, 2017. “We are going to ask them to be professional and to continue to provide services for their citizens,” a Spanish official told VOA. The strategy is to be as light-touch as possible and for the intervention to be as brief as possible with quick early regional elections. On Saturday, the Spanish prime minister announced plans to impose direct rule on the troublesome Catalonia — marking the first time since 1933 that an elected Spanish government has stripped Catalonia of its semi-autonomy. 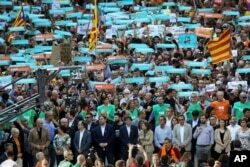 The separatists' answer came Sunday when an estimated 450,000 took to the streets of Barcelona to protest on a warm sunny evening the proposed direct-rule measures and to demand the release of two prominent independence leaders, who have been jailed on charges of sedition. Catalan President Carles Puigdemont, front raw, center, takes part at a march to protest against the National Court's decision to imprison civil society leaders, in Barcelona, Spain, Saturday, Oct. 21, 2017. 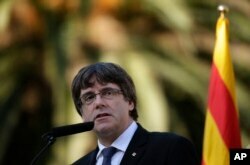 Catalan president, Carles Puigdemont, has pledged the region will not accept Madrid's plan for direct rule, describing it as the worst attack on Catalonia's institutions since General Francisco Franco's 1939-1975 dictatorship, under which regional autonomy was dissolved completely and the Catalan language suppressed. His advisers say he may declare a formal break with Spain on the day, most likely Saturday, that Madrid moves in to take over. The separatists are plotting their resistance, defying a warning from Spain’s attorney general that acts of rebellion will carry lengthy prison terms. “Passive resistance” classes are being held — some taught by 70-year-old Pepe Beunza, who spent years in Spanish prisons in the 1970s during Franco’s dictatorship. 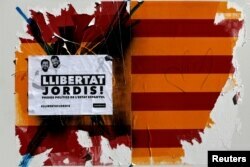 A damaged sticker of a Spanish and Catalan flag and a placard reading "Freedom to Jordis!" in reference to leaders of two of the largest Catalan separatist organizations, Catalan National Assembly's Jordi Sanchez and Omnium's Jordi Cuixart, who were jailed by Spain's High Court, are seen in Barcelona, Oct. 22, 2017. As the dangerous game of political chicken nears a denouement there are many here in the Catalan capital who feel impotent and puzzled why the conservative national government of Mariano Rajoy keeps on gifting — as far as they are concerned — the Catalan separatists propaganda wins. In Barcelona’s warren-like medieval Barri Gotic, or Gothic Quarter, an area filled with trendy bars, clubs and Catalan restaurants as well as tourists, VOA found more people ambivalent about independence than for it. But all were alarmed about how the confrontation might play out, and critical of the central government’s strong-armed tactics — like its attempt to stop the October 1 referendum, which left about 800 people injured. 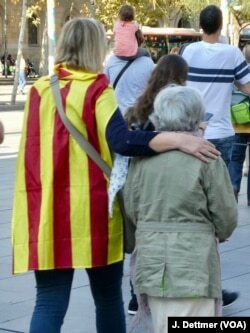 A guiding hand: grand-daughter and grandmother make their way to join a pro-independence rally Sunday in Barcelona. They worry Madrid is being led by the nose into yet another trap that will prompt more support for the separatists. “The government should be softer,” 30-year-old Maria told VOA. She said she didn’t hold a strong position about whether Catalonia should be independent or not. “Maybe we should have a bit more autonomy,” she mused. Less than half of the region’s 7.5 million Catalans turned out to vote in the referendum earlier this month, although 9 out of 10 who did, backed independence. But separatists think the political trajectory is favoring their cause. Catalan separatists and their supporters complain their democracy has been gagged, but less than half of the electorate turned out to vote in the Oct. 1 referendum. Tanya Verge, a political scientist and prominent separatist, noted that Catalans have been divided on secession but she said the government’s strategy is backfiring. Catalans who were ambivalent about breaking away from Spain are being pushed into the pro-independence camp, she says. “There’s a strong Catalan consensus on our right to self-determination, and with Madrid and all the national parties being opposed to even dialogue that’s making more people side with us,” she said. 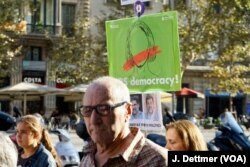 But an opinion poll Sunday for El Periodico, a Barcelona newspaper, found only 36 percent of respondents backed independence, a 10 percent drop on previous polling.